Cities by their nature are cramped, loud, dirty places, choked with smoke and a mass of humanity. To enjoy some peace and calm with just the sounds of nature and fresh air, clubs and organizations have for generations purchased groves and parks that their membership can enjoy away from the hustle and bustle of the city. For the Poles of North Tonawanda’s Ironton neighborhood, the place that was all their own was Polonia Park on Payne Avenue. As early as 1929, the Polish-owned plot of land across from 17th Street and Payne Avenue and extending to 21st Street (now near Greenwood Circle), had been called Polonia Park. Under the auspices of the Mutual Aid Society chapter 983 of the Polish National Alliance, the park was used as a family picnic spot and a place when politicians could meet and greet the Polish people. Slowly, the Aid Society began adding amenities, an area for the Polonia Girls Drum Corps to practice, then a softball field, and a baseball diamond. By the summer of 1932, the park had been developed to the society’s satisfaction and on June 24th following the Washington Bicentennial parade, Polonia Park was formally dedicated with a plaque being placed at the entrance of the park. With the park now available for use, Edward Rudzinski was appointed as information manager, providing information to any organization interested in using the park. The first picnic at the park was held on June 12 by the Our Lady of Czestochowa society Group No. 81, Polish Union of America which had great attendance. With a beautifully maintained, well manicured space in a tranquil setting, Polish organizations from across Western New York began having their outings at Polonia Park. Black Rock’s Polish Cadets, the Polish National Catholic Church, North Tonawanda Dom Polski, St. John Kanty’s Alumni Drum Corps, and Transfiguration Roman Catholic Church all held in picnics the first year. Many considered Our Lady of Czestochowa Church’s outing the best, with games, races, dancing, music by the Moonlight Melody Boys, and big bowls of chicken chowder. That year’s season ended with the Polonia Girls Drum Corps concert and picnic on September 4. One of the largest events Polonia Park saw was the 1933 silver anniversary of the Mutual Aid Society. Starting with a mass at Our Lady of Czestochowa, the society with 400 other participants marched from the Dom Polski to the park where 600 guests were waiting. Speakers included Stanley Rosinski, editor of the Polish Daily newspaper; Paul Myszka, W. Bartosynski of Council 19; and Mr. J. Rodzaj of Elmira, NY. 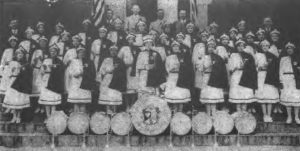 One of the organizations to make the most of the park was the Polonia Girls Drum Corps, but many non-Polish organizations utilized Polonia Park as well. They included the Taras Shevchenko Ukrainian Society, the Niagara-Frontier Post No. 1041 American Legion, and the Hertel Avenue Citizens and Taxpayers Association. 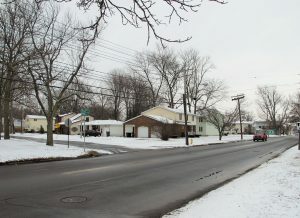 As development of North Tonawanda moved east of Oliver Street and the park became harder for the society to maintain, the land was sold and the area was developed into Greenwood Circle and part of Mid City Plaza. Still, over a half century since the park vanished some locals refer to the area as Polonia Park. "Candidates for Office Will Address Picnickers." The Evening News [Tonawanda, NY] 31 Aug. 1929: 2. Print. Dan, Middleton. "About Town." Tonawanda News [Tonawanda, NY] 21 May 1983: 2. Print. "Ironton." The Evening News [Tonawanda, NY] 6 Sept. 1932: 3. Print. "Ironton Activities." The Evening News [Tonawanda, NY] 29 June 1935: 3. Print. "Mort Jones Speaks Before Ukranian Society Members." The Evening News [Tonawanda, NY] 23 July 1934: 2. Print. “Niagara Frontier Post To Picnic at Polonia Park." The Evening News [Tonawanda, NY] 31 July 1934: 2. Print. "N.T. Polish Nat. Alliance Anniversary Is Observed." The Evening News [Tonawanda, NY] 21 Aug. 1933: 2. Print.
" O.L.C. Parochial Picnic." The Evening News [Tonawanda, NY] 5 July 1932: 3. Print. "O.L.C. Picnic." The Evening News [Tonawanda, NY] 13 June 1932: 2. Print. Oriole Patrol. The Evening News [Tonawanda, NY] 30 Aug. 1929: 3. Print. "Picnic Committee Met." The Evening News [Tonawanda, NY] 5 Aug. 1932: 2. Print. "Picnic In Polonia Park Tomorrow." The Evening News [Tonawanda, NY] 13 July 1935: 3. Print. "Picnic Tomorrow." The Evening News [Tonawanda, NY] 22 June 1925: 3. Print. "Polonia Park Approved." The Evening News [Tonawanda, NY] 26 May 1932: 3. Print. "Polonia Park Schedule Ended." The Evening News [Tonawanda, NY] 9 Sept. 1932: 2. Print. "To Dedicate Park June 24th." The Evening News [Tonawanda, NY] 2 Apr. 1932: 3. Print. "To Hold Picnic." The Evening News [Tonawanda, NY] 6 June 1931: 2. Print. "Rehearsal Tonight." The Evening News [Tonawanda, NY] 1 Sept. 1932: 2. Print. "Yesterday's Picnics." The Evening News [Tonawanda, NY] 18 July 1932: 2. Print.